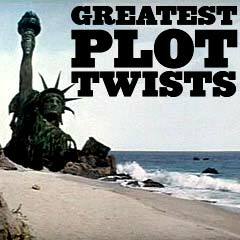 Greatest Plot Twists, Spoilers, Surprise Endings: Avid filmgoers often speak about seeking rare movie surprises in the movie-going experience, such as discovering films that have cunning plot twists, a shocking surprise ending, an unexpected revelation about a particular character, or some other unknown or unsuspected narrative element. with the greatest movie twists, spoilers, and surprise endings. During and after the 1970's, major motion pictures began to "play tricks" more regularly on audiences, partly in homage to the "Master of Suspense" Alfred Hitchcock, but also after the re-discovery and appreciation of acclaimed B-films - film noirs in particular that used plot twists fairly regularly - and found that audiences reacted well to them. For example, Hitchcock's Psycho (1960) was one of the first films to caution audiences to not reveal the "shocking secrets" - other films were to follow, e.g., Planet of the Apes (1968), Presumed Innocent (1990), The Crying Game (1992), The Sixth Sense (1999) and The Others (2001), though unlike Hitchcock's carefully devised marketing ploy, these were grassroots campaigns by the filmgoers themselves. Plot twists often help to make film-viewing a renewed experience, because a lot of the hints and red herrings in the film (that were missed during the first viewing) take on new meaning during a second screening. However, some plot twists have become so over-used that they have become tiresome and expected cliches (Halloween (1978) - the "undead dead", or Open Your Eyes/Abre Los Ojos (1997, Sp.) - reality is only a dream). Directors who are best known for film twists include Alfred Hitchcock, Brian De Palma, Pedro Almodovar, M. Night Shyamalan, and Dario Argento. A Word About Spoilers: When narrative elements, usually reserved for late in a film's plot development, are divulged to others who have not yet seen the film, they are termed spoilers. It is usually considered malicious, unfair and a major faux pas to reveal 'spoilers' without a warning, because their publication can 'spoil' or ruin the enjoyment of experiencing a film's twists and surprises for oneself - without advance warning. Film critics often fastidiously avoid providing spoilers in their reviews, in order to not offend their readership. Spoilers may generally include the revelation of the criminal or culprit, some other secret identity, or some other major plot event that changes the entire direction or perception of the film. However, some advance marketing of teasers and other ads have often revealed a film's entire plot. And some spoilers have become very common knowledge, i.e., Planet of the Apes (1968), so that they are no longer considered real spoilers. Sometimes, a spoiler has been embedded in a famous line of dialogue or tagline, such as "Soylent Green is people!" Many spoilers are inexplicably revealed explicitly on (1) video/DVD box covers and its cover art (i.e., The Letter (1940), Random Harvest (1942), The Bridge on the River Kwai (1957), Planet of the Apes (1968), Close Encounters of the Third Kind (1977)), (2) the DVD menu itself (i.e., Barton Fink (1991), The Shawshank Redemption (1994)), and (3) the trailer.